While I’ve been a photographer since I was 14, when my bedroom became a darkroom with a bed in the corner, I’m a complete beginner where video is concerned. The closest I’ve ever got to video production was putting together a few exceedingly basic cycling videos in iMovie to share with friends. However, since we live in an age when tech writers are increasingly expected to be video producers, and I love to learn new skills, I’ve set myself a new goal for 2017. At some point in the year, I want to be able to produce professional-looking review videos that wouldn’t look out of place when viewed alongside the output of my extremely skilled colleagues. I’ve upgraded to Final Cut Pro, and I’ll be taking you guys along for the ride – beginning with the demo video for this review. The hardware is compatible with just about every app you could name, including Garage Band and Logic Pro on the audio side, and iMovie and Final Cut Pro for video – plus just about every Adobe app in existence. Cleverly, the device detects which app is in use and automatically changes its functionality to match. If you look at a professional editing suite, one of the things you’ll immediately notice is that nobody is moving back and forth in video using anything as crude as a trackpad, mouse or cursor keys. What they use instead are wheels which allow smooth back-and-forth movement within a video, at speeds ranging from the blindingly quick to frame-by-frame. An example of this type of equipment – used in both audio and video production – can be seen below. The price of such pro kit, however, puts it well out of reach of the hobbyist – or even aspiring semi-pro creators. And that’s where the Contour ShuttleXpress comes in. This is a $60 piece of kit that aims to match the core functionality of equipment costing hundreds or thousands of dollars. Sure, it’s plastic rather than metal, and the functionality is limited, but the core principle is the same: you get two wheels which allow smooth and precise movement within your video timeline – alongside some programmable function keys to further speed up your workflow. Contour actually offers two different Shuttle models. The ShuttleXpress (left) is the entry-level device, while the ShuttlePro (right) is a more sophisticated version with 15 buttons, nine of which have removable keycaps to allow you to label them. As a video novice, I decided to start out with the more basic model – but I’m expecting to progress to its bigger brother once I gain enough familiarity with Final Cut Pro to have need of more than five buttons. Both models have one drawback for 2016 MacBook Pro owners: the USB 3.0 cable is hard-wired to the Shuttle, so you need an adapter to connect it to your Mac. You need to download an installer, which provides the necessary drivers for the Mac, and an app which allows you to program the buttons. You can also customize the functionality of both wheels if desired. The device comes with preprogrammed buttons for each of the extensive range of supported apps. Since I’m completely new to Final Cut Pro, I programmed the first two with the two tools I mostly use. This was as simple as highlighting the button and typing the keyboard shortcut. The easiest way to see how you use the ShuttleXpress is to show you. On Boxing Day, my partner and I threw our Brompton folding bicycles in the back of the car and headed out to a nearby forest with some lovely quiet cycling roads. I positioned a GoPro Hero 5 (review to follow) at the side of the road to get a quick ‘flypast’ clip. I then needed to edit out the before and after to leave just the short clip of us cycling past, and that’s the video I’m using to illustrate the process. 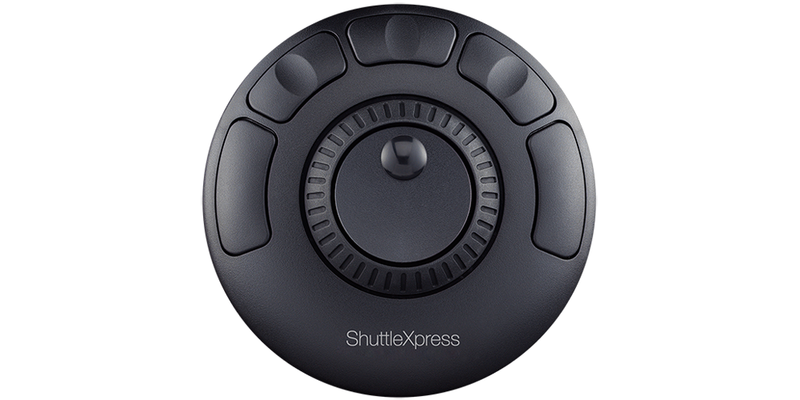 The ShuttleXpress is made from the ubiquitous black ABS plastic common to most gadgets. It has a neutral look, neither looking premium nor cheap. The main, outer wheel – used for rapid movement through the video – is quite strongly spring-loaded, returning automatically to the centre position. The wheel moves smoothly and easily, the spring providing greater resistance the further you turn it – a simple way to provide tactile feedback on its position. 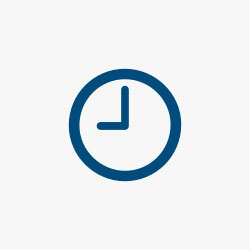 The inner jog dial has no spring, as it operates only when you turn it. As this is designed for frame-by-frame movement, it has a ratchet mechanism which again provides both auditory and tactile feedback as you use it. It moves easily with a single finger in the depression, though does feel a little cheaper than the main wheel. Three of the five buttons have finger depressions, for easy identification by feel. The button movement is shallow but positive, with a clear click when used. 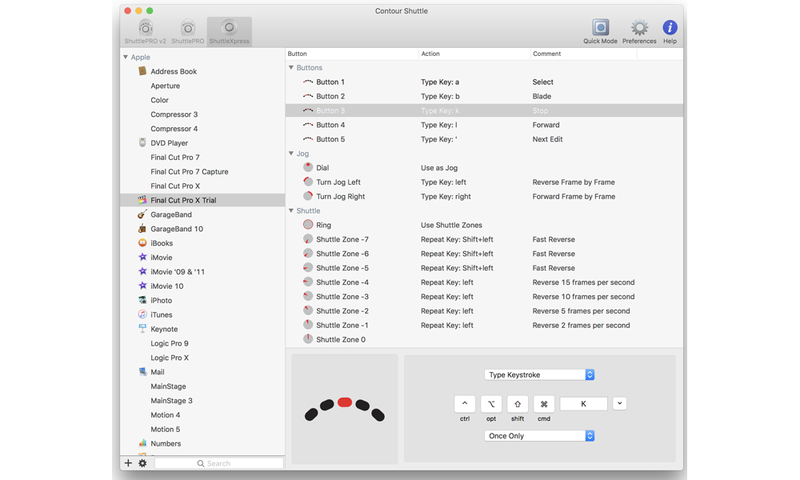 The ShuttleXpress has to be one of the most intuitive devices you could ever use. Even to a video novice like me, it felt immediately natural. Literally within seconds of connecting it, I was comfortable using the main wheel to move through video clips at my desired speed, and the jog-dial for precise frame-by-frame movements. The spring-loaded main wheel provides excellent feedback on the speed, and the fact that it snaps straight back to the centre, stationary position when released means that the fast-forwarding or rewinding never runs away with you. You may have noticed in my video demo that I over-ran the end-point of the video by a few seconds, but with more use I quickly came to be able to reduce speed and judge my stop points more precisely. The frame-by-frame jog-dial is a delight to use. It’s both faster and easier than the arrow keys. Being so new to Final Cut Pro, I’m not even scratching the surface of its capabilities, so I don’t yet know how I will end up programming the buttons, but even the two I used in the demo felt like a smoother way to use the app than the keyboard shortcuts. And that’s really all there is to say about the in-use experience: intuitive, pleasurable, efficient. I already never want to edit a video without a wheel. I’ve just bought a DJI Mavic Pro drone (review on that also to follow), mostly for use when travelling, so that’s going to have me editing videos while away. I always travel light, but I’m definitely going to find room for the ShuttleXpress next trip I take. For me, the only question-mark would be whether to recommend buying the ShuttleXpress or the more expensive ShuttlePro. Right now, the ShuttleXpress meets my needs – and at $60, it’s sufficiently inexpensive that I feel I can call it a must-have purchase for anyone getting into video editing on anything but the most casual of levels. At $150, however, the more sophisticated ShuttlePro becomes a more considered purchase. For someone like me, who’s intending to get into video in a reasonably big way, I suspect the more expensive model will probably end up justifying its price. The more Final Cut Pro features I start to use, the more buttons I’m going to want – so my expectation is that I’m going to make the switch to the Pro sooner rather than later. For those who expect their needs to remain more basic, the ShuttleXpress is much easier to justify. Either way, though, once you’ve experienced video editing with either device, I don’t think you’re going to be without one. The Contour ShuttleXpress costs $60. The ShuttlePro V2 costs $150. If you’re thinking about joining me in upgrading from iMovie to Final Cut Pro, the app costs $299 from the Mac App Store. The good news for iMovie users is that, while FCP is vastly more capable, the basic user-interface is the same, making it a relatively painless transition.